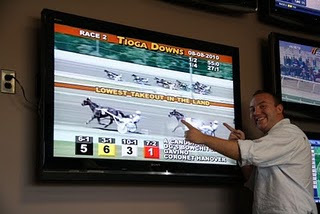 At the beginning of the Tioga Downs harness meet, where they reduced takeout to state law mins, HANA, Paceadvantage.com and a few harness players got together and created a new contest for their meet - the Pen and Micro-Chip challenge. The challenge was pretty simple: get two computer picks programs and pit them against two very good human handicappers. Trackmaster offered their Chatsworth Consortium picks out for a computer challenger. Ray Schell offered his program (Rays Robot) out for a test spin and two human cappers with decades upon decades of experience - Mel and Bobby Z - would take the banner for the pen and paper crew. These challengers diligently did their work, playing the entire meet. And boy, did they do well. In the end, Trackmaster's entry won, with a whopping 16% ROI. Coming second was Bobby Z with a 4% ROI, third was Mel, with a very respectable -5% ROI and Ray's Robot ("I think windows 7 screwed him up") still beating the take with a -9%. This is amazing; players and computer programs picking every race and showing profit as we all know, is extremely difficult. Yet, there were two of the four over the waters edge, and the two who did not make it, were close. Overall the computers won the challenge by 5%. Trackmaster will be contacted to see where they want the winnings donated. On the side contest run by Ray at Paceadvantage, we found out one thing - there are some sharp players on that board. A couple had an exacta profit, and one poster "Mirror Image" won the side prize with a 14% win ROI. Outstanding! Tioga's takeout reduction for this meet appears to have bucked the handle trend in NA. It looks like it might even be up, which is hard to do in harness this season. For players, it supplied them with some interesting racing, and fuller fields. Jason and the crew at Tioga are to be commended for trying. It caught our eye, and later on it even caught the eye of Bill Finley at ESPN, who wrote a national piece on this little track; a track that tries. We'd like to thank everyone for participating in the contest on Pacedavantage.com, and we'd like to congratulate the winners. A special thanks goes out to Trackmasters President Dave Siegal, Ray, Mel and Bobby at Pace for taking time out of their day to post picks, every day. Ray, who ran the contests, worked tirelessly on them, and on behalf of HANA: Thank you so much Ray. Final overall players and standings below (challenge players and the four protagonists all together). Please click to enlarge. Just wanted to say thank you for making this one of the summers to remember. I look forward to next year's meet at Tioga Downs! Another big thank you to all. It was fun watching and using the site's picks in our handicapping. Tioga Downs is a great track with many on track handicapping contests too. Can't wait until next year!